We were like two peas in a pod. She was the yin to my yang. 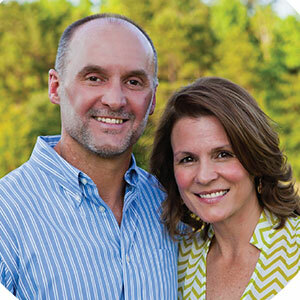 To borrow a phrase from Jerry McGuire, Dawn “completed me.” When we first started dating, she was the essence of perfection – a musical beauty queen, confident and self-assured, rocking an 80’s perm like noboby’s business, sly with her humor – she was my Miss Wit and I was her Mr. Wit. Dawn was precisely what I was looking for in a future wife – a beautiful, Jesus lover who could cook, sing and make me laugh. What else could a man want?! What was true in 1987 is still true all these years later – when it comes to love and marriage, you will always find what you’re looking for. Ironically, the very attributes I admired most about Dawn in the “honeymoon phase” of our relationship, over time, became the very attributes that irked me the most. In no time, in my eyes, Dawn’s self-assured, confidence became bull-headed stubbornness. Her beauty became vanity. Her sly wit became subtle jabs of sarcasm. And, in the interest of full disclosure, she would have said the same, if not worse, about me. It’s a reality many of us seem to miss, that when it comes to love and marriage, you will always find what you’re looking for. Solomon put it this way, “He who seeks good finds goodwill, but evil comes to him who searches for it” (Proverbs 11:27 – NIV). While dating and in the limerence, honeymoon phase of our relationship, both Dawn and I sought to find good in one another. And good is what we found. However, after the marital newness wore off and reality set in, we began focusing on each other’s faults and shortcomings. And guess what? We began to find that which we were looking for – evil intentions, self-serving motives, and vain conceit. What was and is still true for me and Dawn, is true for you as well. 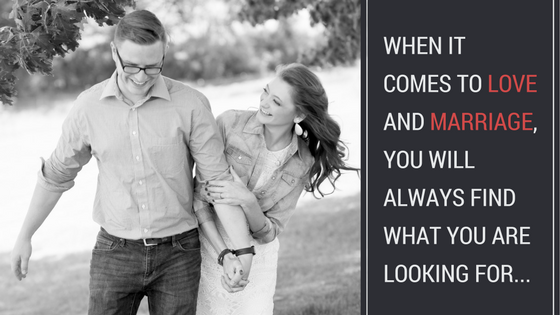 When it comes to love and marriage, you will always find what you’re looking for. If you’re in a relationship and you’re looking for good in your mate, I can promise you, you will generally find good. Likewise, if you’re looking for something wrong in your mate, you can rest assured you will probably find that as well. The key to lasting, loving relationships is to seek the good in one another. Dawn and I turned a corner in our relationship when we began to assume the best about one another. This simple practice has made all the difference in our love and marriage. We choose to seek good in one another by assuming the best about one another. Could we easily search for evil in one another by assuming the worst? Absolutely. But, if we did so, we would end up like many marriages you and I know – bitter, resentful, roommates, that function at best as business partners. And that’s not what we want for our marriage and the generations that will follow us. And my hunch is that that is not what you want for your relationship either. So, how does this apply to you? Today, if in a relationship, rather than focusing on what’s wrong with your mate, why not focus on what’s good about them? Rather than assume the worst about your partner, why not assume the best? Try it and see what difference it makes. When it comes to love and marriage, you will always find what you’re looking for. “He who seeks good finds goodwill, but evil comes to him who searches for it” (Proverbs 11:27 – NIV).